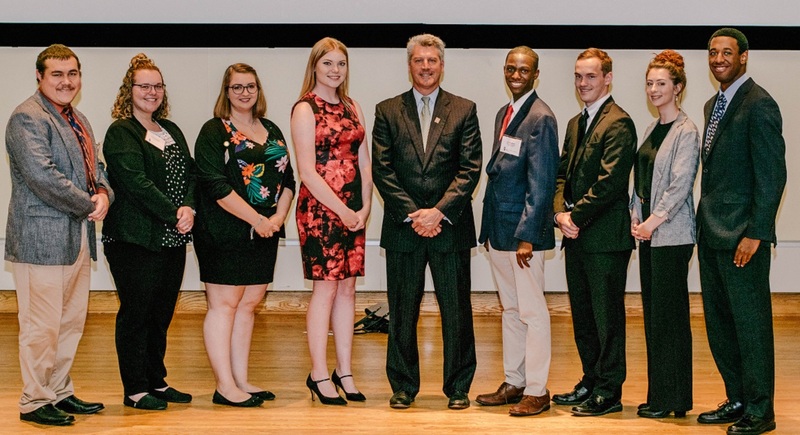 Criminal Justice Student Association leaders with Timothy Heaphy. Photos by Alex Krall. 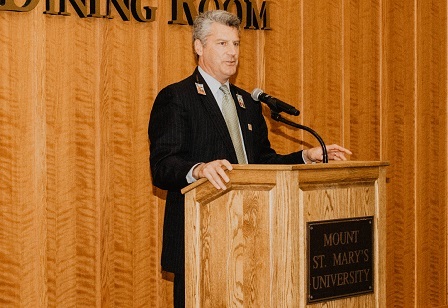 Timothy J. Heaphy, a well-regarded lawyer who led an independent review of the August 2017 white nationalist rally and counter-protest events in Charlottesville, Virginia, on October 4 presented the annual Delaney Lecture, organized by the Criminal Justice Student Association. In offering a critique of the city’s response to the Unite the Right Rally, Heaphy asserted that the Charlottesville police force’s lack of planning for a protest by white nationalists aimed at preserving statues of Confederate generals and a counter protest by anti-racist groups, turned the event into a “chaotic mess,” resulting in three lives being lost and over 35 injured. In analyzing how these rallies turned wrong, Heaphy conducted more than 150 interviews of officers, white nationalists, anti-racist protestors and citizens; watched hours of video from the day of the event; and read numerous documents, emails and text messages. Heaphy, who delivered his report just 90 days after the riots, found that the city of Charlottesville failed to adequality prepare for the riots and did not use all the resources available to them that would have dramatically changed the outcome of that day. While the city of Charlottesville could not deny the white nationalists their right to freedom of speech, as long as they did not directly call for violence, everyone who was watching the planning of the Unite the Right Rally over social media foresaw trouble, Heaphy said. Comments from both white nationalists and anti-racist protestors suggested a strong potential for violence. However, the Charlottesville police did not seek input from law enforcement agencies that had experience in handling similar situations or properly train officers prior to the rallies. In his interviews Heaphy found that while the officers were given tactical gear, they never did field training. This meant that on the day of the rally, several officers put on their riot gear for the first time. In addition, in an attempt to subdue the rally, the city tried to move the protest to a different location but ultimately lost a lawsuit regarding the issue. Due to this attempted move, residents of Charlottesville did not know the confirmed location until the night before the rally. The Charlottesville police also failed to notify the public about plans for the rally, such as what streets would be blocked off and plans for foot patrols. Possibly the biggest mistake the officers made was that they did not adequately ensure separation between the white nationalists and the counter-protestors, Heaphy said. Instead, the police were behind barricades surrounding the park, while both groups of protestors were mixed together. When the time came for officers to put on riot gear, the gear was stationed at the end of the park, so they left the protestors essentially unsupervised. Officers had access to both Charlottesville SWAT teams and Virginia State Police SWAT teams and did not use either resource, thinking they could handle it on their own. When the Charlottesville police finally called in a militarized state force for assistance, it took too long for them to reach the park; the state force was stationed at a location five blocks away from the site of the rally. Lastly, the traffic plan for the rally placed insufficient resources at particular intersections, leaving the downtown area susceptible to a vehicular attack. According to Heaphy, Charlottesville police prepared for a crowded event like a concert, not a violent protest. Heather Heyer, a young woman who was killed after a white nationalist backed his car into counter-protestors, was in an unmanned area with only a small blockade that did not cover the width of the intersection as protection. Later, a helicopter crash killed two Virginia state troopers.Addressing criminal justice majors and law enforcement officers in the audience, Heaphy suggested that police departments would be wise to heed the Charlottesville report in being prepared to maintain order and ensure safety during large-scale protests.